Title: BNSF 6721 with the rear end of BNSF 6894 pass me into the setting sunset as they head westbound pulling a Z Train. Description: Very Clean and Brand New C4's just out of ERIE, PA. Title: BNSF 6894 heads eastbound as a Lead Unit pulling a Z Train towards the BNSF Barstow yard. Title: BNSF 6894 A Very Brand New ES44C4 which less than 12 hours ago I got in Fullerton, Ca leads a Hot Chicago Z Train into the BNSF Barstow yard. Title: BNSF 6894 Leads a Hot Z Train into the BNSF Barstow Yard for a crew change and continue her Journey East towards Chicago, IL. Title: The Rising California Sun Gleems off this Very Brand New BNSF 6894 and her BNSF Swoosh Logo Paint as she slows down to enter the BNSF Barstow Yard. Title: BNSF 6894 as she rolls into the BNSF Barstow yard and the sun reflects off her BNSF Swoosh Logo Paint. Title: The California Sun Glistens off her Very Brand New BNSF Swoosh Logo Paint as BNSF 6894 leads a eastbound Z. Title: Up Close and in the cab of BNSF 6894 as she pulls a eastbound Z into the BNSF Barstow yard. 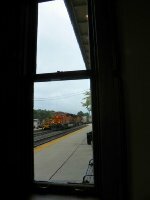 Description: A manifest heads west as seen through the bay window of the Hinsdale station. Title: BNSF 6808 enters the BNSF Barstow yard at 17;58 pm/PDT at sunset Leading the Z RIC-CAL Double stack train. Description: Sunset on A Very, Very Brand New ES44C4 last caught on Oct.14, 2011 at BEREA, Ohio on her way to Chcago, Il to enter the BNSF Railway System. Title: BNSF 6808 with BNSF 6894 behind her Light Up their BNSF Swoosh Logo and Reflective Paint as my flash catches them both at Sunset as they enter the BNSF Barstow yard for a crew change and continue eastbound. Description: Flash Shot of a Very, Very Brand New C4 at Sunset!!! Title: BNSF 6802 with Her Sisters BNSF 6894 and BNSF 6808 (Lead Unit) pass me by as they enter the BNSF Barstow Yard off the Mojave Connecter!! Title: BNSF 6808 with Her Sister C4's BNSF 6894 and BNSF 6802 enter the BNSF Barstow Yard Complex at Sunset with the town of Barstow, CA as the backdrop!!! Title: BNSF 6894 leads a NB freight for old monroe mo. Description: BNSF 6894 leads a westbound empty ethanol train through Oregon, IL. Description: The BNSF Oil Train meets AY4 with the 606 snoot nose at Ayer. Description: The Loaded Oil Train moves at a good pace through Ayer, MA. Description: The BNSF Crude Oil Train rumbles slowly through Graniteville heading East. Description: Trailing unit on a empty oil train. Title: BNSF 7159 Shinning in the bright sun! Description: EB stack's slip past at 65Mph. Title: BNSF 7276 Leads a WB past the Amtrak station. Description: 55 Mph stacks all day long rip past the old Santa Fe town of La Plata Mo. Description: Headed WB with a stack train while another Z train rips WB on the fast track.